I've been a bit distracted lately. I have yet to cast on Pasha's Ridgeline set even though it's getting quite cold around here for little hands and ears to run about without any woolly layers. I'm woefully behind on knitting the sweaters that I want for myself. And let's not even talk about Stormy's serious lack of knitwear. There is a pile of yarn on our table that keeps being moved from end to end depending on who is eating but never seems to get wound or cast on. But, I feel I have a good excuse. You see, I've been sewing up a storm for the littles. Last week I finally broke out the walking foot for my machine and some knit fabric and sewed Pasha a pair of Maxaloones by Max and Meena. He's between sizes right now and finding pants that are not buttoned is absurdly hard. Toddlers who can't even use words don't need complicated pants! Jean buttons are not comfortable for anyone, let alone someone who is wearing a diaper all the time. Ok, rant over. Anyway. I sewed them up on Sunday while the boys watched a football game and he loved them. 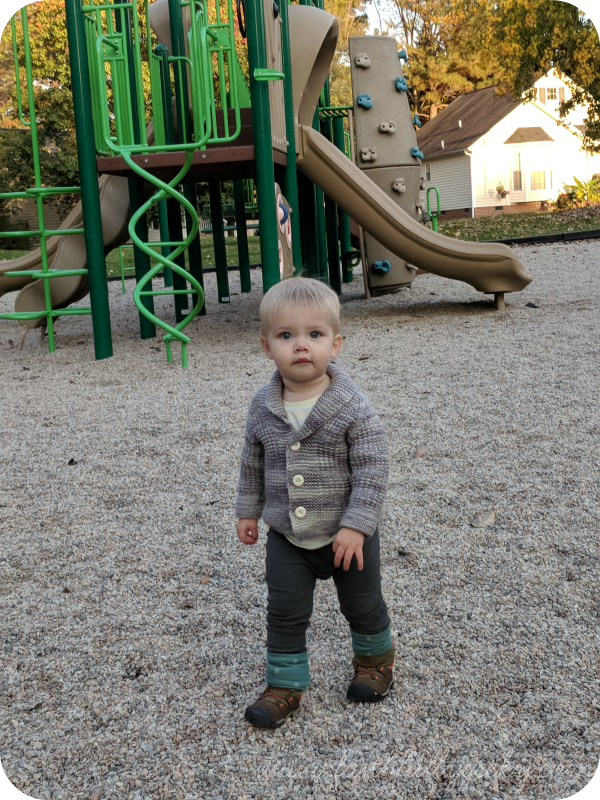 The pattern calls for a contrasting fabric circle on the bum, but I don't necessarily like the look for my kid, so I left it out and sewed a simpler version. I was so smitten with them that I sewed a second pair the following night. Can you tell someone got a haircut this week? I've made several things for Pasha since starting to master my sewing machine and this is the first time he genuinely seems to care about something I've made. My personal theory is that he is starting to have just a hint of an opinion about his clothes (he is only 1 after all), and like most of us he prefers comfort when possible. I made him three pairs before I turned my attention to his brother who, after all, will be born when it is still super cold and be in need of nice mommy-made clothes as well. I might have gone a wee bit overboard. Pictured here are the Maxaloones, Bringing Home Baby Hat, and Dribble Lips Bandanna Bib, all from Max and Meena's pattern line. I have plans to make matching mitts as well because why not. The great thing about sewing is that it takes pretty much all of my brain as opposed to knitting which I can do while multi-tasking. This isn't a bad thing, but when I need a mom break sewing has become my go-to. And kid/baby projects are so fast! I have plans to make a few more things for Pasha, but most of my sewing will probably shift over to Stormy projects for a while with a few detours into cousin sewing because yes, my sister is pregnant so yes, I will torture them with matching outfits until they are old enough to protest. Because I may be the cool aunt, but I'm also the sewing mom and that's what we do. Here at Casa Geeky we are still recovering from the excitement that was Halloween. This is the first time we've lived in a neighborhood that did trick-or-treating and boy does our street do it up right. Our one neighbor has smoke and creepy things moving in their yard and another has a fire pit at the end of their driveway. We just sat on our front porch handing out candy to all the adorable kids until we actually ran out (Never thought that would happen). Because I'm a bit of a slacker mom this year we did not wear costumes, but I did make Pasha a pair of overalls for the occasion. 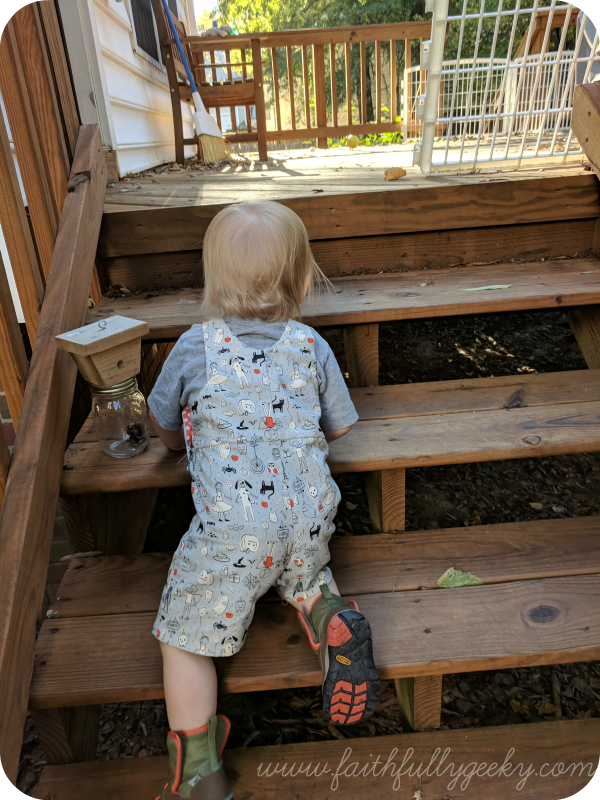 This is the Breezy Romper pattern by Puperita Patterns in Cotton and Steel's Little Monster print and a polka dot by Riley Blake. I started them back in September, but did not actually finish them before Oct 30th for reasons beyond my control. Why? Well . . .
Ok, for starters I loved making these and they were absolutely adorable on Pasha. He got comments all day on how sweet and festive he was. This was my first time working with snaps and I have to say I'm quite pleased with how they turned out. I ordered a variety set from KAM through Amazon and they were very easy to use. The bodice is lined with the polka dot fabric but I did not read the directions correctly for the strap placement, so they are the more traditional snap down style rather than the fold up style featured in the pattern. Where I got hung up was in the crotch snaps. I bought snap tape rather than using the K2 snaps because it is an area that sees a lot more action and I wanted it more reinforced. However, turns out that my little dude, who measured in at the 12 month size when I cut the fabric, actually grew between the start and end of this project. Which is how I found myself on the night before Halloween sitting in my living room, watching Stranger Things, and hand stitching the snap tape in place. I know I could have used the machine but I wanted to have the snaps as close to the edge of the fabric as possible while still enclosing the raw edges. The result? Well he looked cute, but every time I squatted down to play with something or his diaper got a little full the snaps would pop open. We made it work for the day but this was definitely a one time use outfit. I feel a little bad about that, but I got a lot of work on my stitching and hopefully Stormy or a future cousin will be able to rock them for a full October. Last month I swore off sewing for myself. We are less than four months out from Stormy’s arrival (I'm not panicking. Who's panicking!) and I have things I want to get done for both boys that I feel like should take priority over stuff I may or may not be able to wear again after a few weeks. Plus I still have two half-sewn blankets that I started for Paul but never finished because it became too difficult to sit at my sewing machine by the end of my pregnancy. So of course when I watched the latest episode of the Hey Sister Podcast I was immediately possessed with the need to sew myself a Fringe Dress by Chalk and Notch after seeing how adorable it was as maternity wear. But again, I’m not sewing for me, so there’s no way I would let myself go out and buy fabric for the dress I am not sewing. 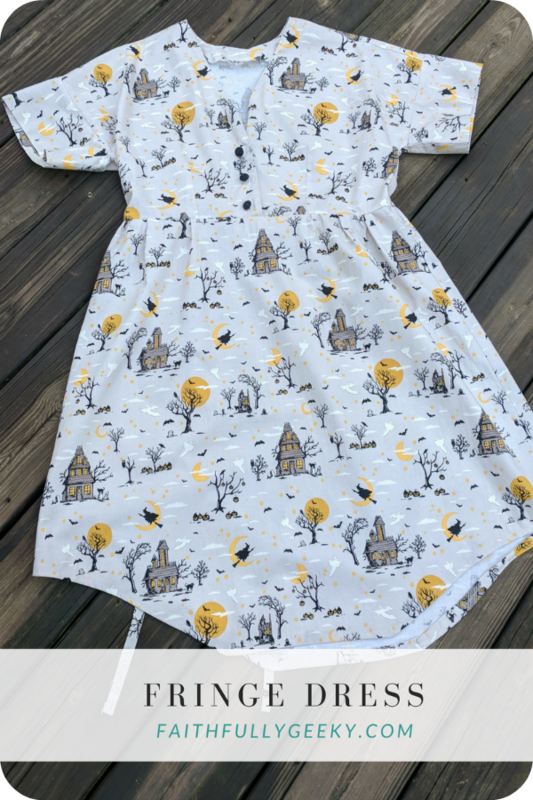 A few days later, however, I still could not shake the need to make one and so went up to my (tiny) fabric stash and pulled out this Riley Blake Halloween fabric. Next thing you know I have pasted together the pattern and started cutting. 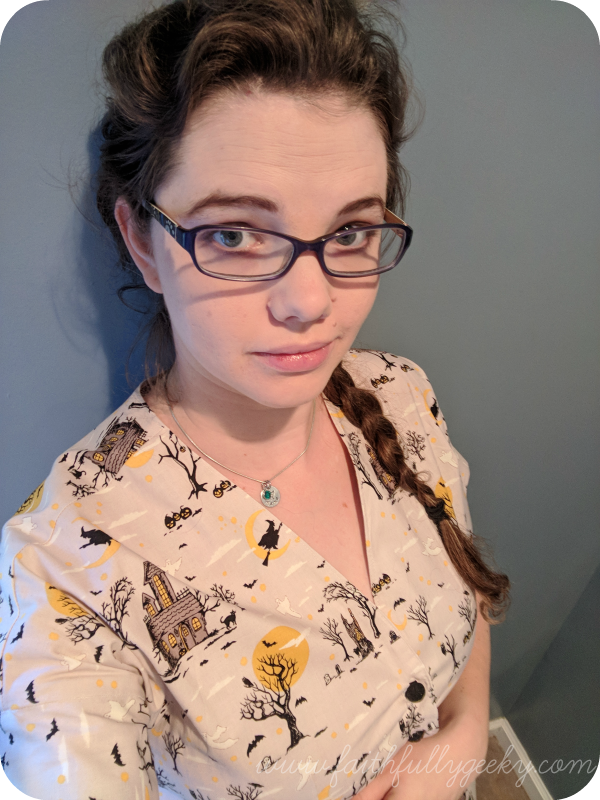 I only had three yards of fabric, which is about a half yard shy for the size 12 I needed, but I somehow managed to make it work by omitting the pockets and buttoned sleeve tabs. Please forgive the messy selfies. My toddler is not yet a trained photographer. When I started this pattern all I saw was a cute dress that would work well for my growing baby bump and buttons that would accommodate breast feeding should I be able to continue wearing it next fall. What I did not take into consideration is all of the techniques I had never tackled before -- curved hemline, buttons, waist ties, open bodice. Once I sat down to start sewing I felt a little overwhelmed, but by then I was committed so I pressed on. Fortunately the pattern is very clear and I set out with only a small amount of hesitation. Even though this is a very straight forward pattern once you get going I found myself taking an extraordinary amount of care with my sewing. I’ve never been a very precise sewist (I say never. I’ve only been sewing about a year), but I found myself really wanting to make everything as perfect as possible. This meant that sewing sections like the front facing took me over an hour, but they are the nicest facings I have ever sewn and I am quite proud of how they turned out. My skirt gathers and buttons, however, were an epic fail. I cannot seem to figure out sewn gathers. This is the second garment I’ve sewn which calls for them and I love the final result, but I just could not manage to get the skirt to gather. Maybe because the gathers come after the side seaming? In any case I faked it as best I could and called it a day. The button holes also turned out much more sloppy than I anticipated. The buttons I picked out kind of hide the fact, but I did rip the fabric when opening up the one closest to the waistline. They are also a tad too far from the edge, so the placket bows out just a touch. Selfies from the right only please! Overall I am very pleased with this dress. 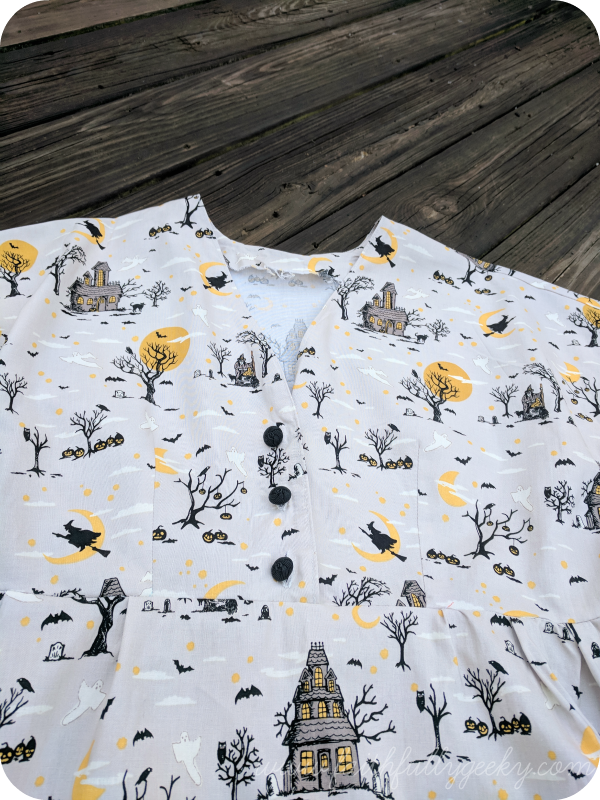 My only complaint is that it is out of very distinct Halloween fabric so I won’t get to wear it for much longer. I’m already contemplating at least one more to get me through the winter, but that is ridiculous. I still have to do all that sewing for the boys and that should take priority, right?